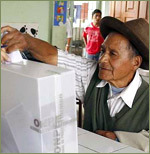 Citizens determine their nation's interactions with the world through elections, collectively and even with individual acts. As globalization's forces buffet the world, seen time and time again since the start of the 21st century, the internal politics of any state can permanently alter course for other nations: the ruling Taliban in Afghanistan allowed jihadists to plot air attacks on the US World Trade Center and Pentagon; rising home prices in the US and unsustainable mortgages triggered a global credit crisis and recession; budget mismanagement and debt in Greece spread panic which called for austerity measures throughout the European Union; and the self-immolation of a hopeless street vendor in Tunisia stirred thoughts of revolution and unrest throughout the Middle East and beyond. Citizen reactions are only magnified by rapid growth of satellite television networks, cell phones, the internet, and social media like Facebook and Twitter. With a click of button, thousands and then millions can view a politician's embarrassing slip of tongue, widening inequality, pollutants crossing borders, work conditions of factories that make favorite products, devastation left by natural disaster followed by spontaneous generosity whether for victims of a hurricane in Louisiana or earthquake-tsunami victims in Indonesia and Japan. Foreign policy in action viewed on global media prompts strong citizen reactions, and elections mold foreign policy. The electoral systems and forms of government are many and varied – plurality, majority or proportional representation; presidential and parliamentary. Yet citizens expect their leaders to provide jobs, education and healthcare, while ensuring adequate supplies of energy and clean water, overseeing fair pricing and regulations, and protecting borders and culture. And of course, citizens expect leaders of other states to reciprocate in their trade and other policies. In 2012, election campaigns are underway for choosing leaders of Egypt, France, Russia, Mexico, Turkey, the United States and other nations. While confronting elections, the primary concern of these leaders is to satisfy their citizens’ demands, and yet that can set them up against other countries’ interests. : France’s incumbent president seeks to mollify citizens by announcing early withdrawal of troops from the NATO operation in Afghanistan, enraging other members; US candidates, blaming China for a loss of jobs, call for a protectionist stance; Russia’s candidates rail against corruption while trying to present a positive outlook for foreign investors. In China, the leaders are selected by the Communist Party which must also take into account public sentiments. The next set of leaders in China must reassess past policies of lending to troubled economies in the West and still deliver growth, jobs and improvements in the standard of living – or risk unrest. This YaleGlobal special section presents articles that analyze the national election campaigns and the consequences that so often reach beyond borders.